ITMA 2019 will take place from 20 to 26 June 2019 at Fira de Barcelona Gran Via Barcelona, Spain. SSM announces their participation of the forthcoming ITMA in Barcelona, Spain. The Swiss based SSM Schärer Schweiter Mettler AG, the inventor of the electronic yarn traverse system, will continue their tradition of trend-setting with the presentation of breakthrough technologies such as preciforce™and powerblade™. Come and see us at ITMA 2019 to get more information about our highlights and best solutions for your future business. SSM software manager Göksel Karaarslan knows only too well how a properly wound package looks like: it features a uniform density and no visible surface structures. “No pattern”, as the experts say. This is important because a yarn package can, for example, only absorb the colour evenly if it is neatly wound. “Nobody wants to wear spot-tily dyed clothes”, says Karaarslan. More-over, it is much easier to efficiently process sound packages. The problem is: the winding machines often fail to instantly wind packages that can be easily dyed. This is due to the fact that there are thick yarns, thin yarns, rough yarns, smooth yarns, straight packages, conical packages … the list could be continued infinitely. Good winding machines must take into account all these parameters and, at the same time, constantly produce packages of high quality. In case a package is wound in a suboptimal way, this situation will lead to problems in the downstream processes and, as a consequence, result in additional disadvantages. Additional disadvantages, however, cost time and money – money that is often lacking in the highly competitive textile market. Therefore SSM has developed an algorithm, in cooperation with a renowned university, enabling the winding machines to wind the “perfect” package, regardless of the yarn. The engineers and mathematicians opted for a special approach. Instead of measuring parameters such as yarn tension, density, material, or yarn diameter, and packing them in complicated formulas, they translated the SSM expert knowledge into a theory, allowing for a precise prediction of package structures and density distribution. Using methods from the number theory, they finally managed to get a grip on the “chaotic and dynamic system” of package winding. Based on the calculations, it was possible to devise the DIGICONE®2 algorithm that can be directly implemented into the winding machine control software. By means of high-speed recordings during the winding process and with the aid of x-ray computed tomography, the success of the SSM project was finally confirmed (see image comparative spool). 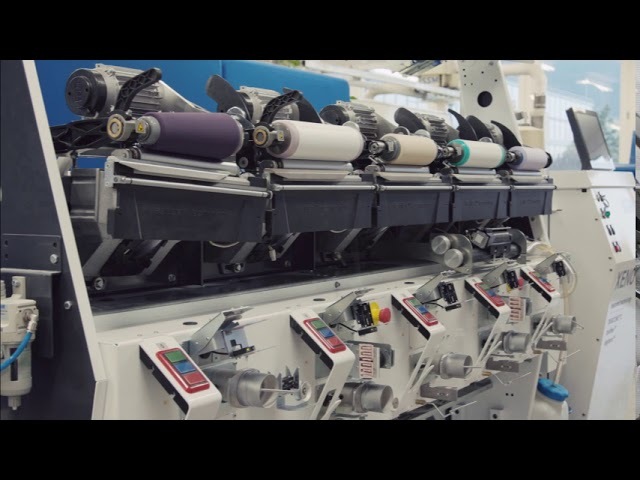 Result: the identically constructed machines, which previously were not always able to wind a package that can be easily dyed, accomplished this task straight-away with the new software. Thanks to the cooperation between SSM and university, the idea could be optimally implemented. “The innovative DIGICONE®2 algorithm enables us to stand our ground in the competition with other winding machine manufacturers”, says Karaarslan. The algorithm is successfully used by the latest SSM machine generation, and many customers have already tangibly profited from it.